A rustproof bathroom ring towel holder fit small bathroom space hanging nearby toliet, countertop, bathroom cabinet, etc. 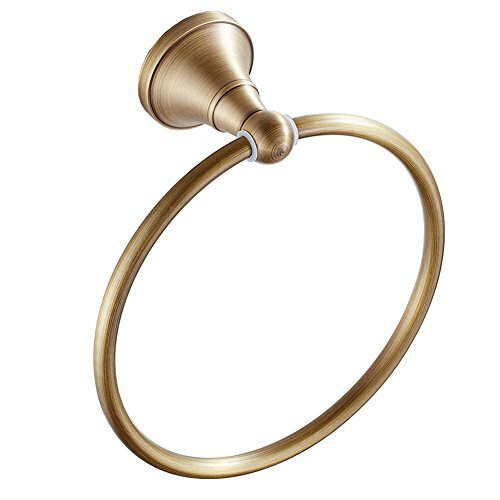 Classic Antique brass color adds great beauty for your bathroom decor, elegance looing for hanging your face towel beside your bathroom cabinet, and also look nice under your kitchen sink cabinet where keep your hand and dish towels. This ring towel holder that kids counld reach easily after swshing hands, the sturdy one piece welded construction and doesn't have fail points if your kids will destroy, solid brass material ensure this rack last for long time. Great hand towel rack for small bathroom, if you dont't have room to fit a towel holder, this is your best choice, you can install on the wall next to your sink.